It was difficult for me when I first started at eating this low-carb high-fat diet to really get a handle on exactly sugars were being added to the foods I was buying. Did you know sugars have over 40 different names? If you don’t know what they are it makes it tough to know what is in the food you are buying. When I first started eating a low-carb high-fat diet I was looking at the sugar content on the nutrition label on the back. Unfortunately it didn’t differentiate between added sugar and the natural sugar that might occur in the food that I was trying to buy. 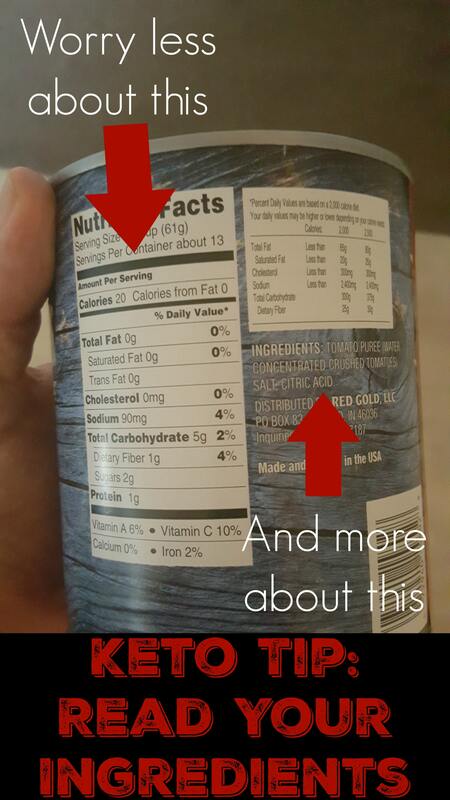 I didn’t so much care about the natural sugar from, say, a tomato but I wanted to know if there was any sugar that had been added to the food during the preparation or packaging process. So what I begin to do is to read the ingredient list to find out if any of the 40 different names for sugar showed up there. That way I would know if any sugar had been added to the food that I was buying. Of course as I progressed and the weight continued to come off I quickly realized that the best type of food is the food that doesn’t have a nutrition label or ingredients list at all. I now mostly eat real food like produce, meat, or dairy. However, I still make a point reading the ingredients list every time I buy something in those “middle aisles” at the grocery store. I am always surprised at the companies that feel like they need to add sugar to my stewed tomatoes or garlic salt. Also, we are being promised new nutrition labels that we should start seeing pretty soon that will tell us the amount of added sugar in our food but until that comes, we still need to be diligent about keeping as much sugar as possible out of what we eat. PREVIOUS POST Previous post: Welcome Vinnie Tortorich Listeners! NEXT POST Next post: 7/13 Weightloss Wednesday: Back Moving in the Right Direction! Pingback: 7/13 Weightloss Wednesday: Back Moving in the Right Direction! Great post! I’m sugar free and it’s been amazing what things have sugar so great reminder to everyone!